LOVE CRAFTS FOREVER: Christmas projects at OSAAT. Welcome to new challenge at OSAAT. This week we like you to make Christmas projects. 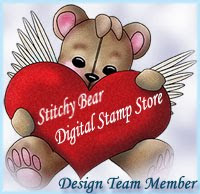 Our challenge this week is sponsored by StitchyBear Digi Outlet. Where you can win $9 to spend at our store ( If you use a digi from StitchyBear Digi Outlet ) . For my card i used digi image by April "Holiday Center Piece". You can find it HERE. Image was colored with Distress ink, and i added glitter to it. Here is a pick for my decorative elements. I used many die Cuts and punches. Also used embossing powder to make my flower, by stamping and die cut with Heartfelt Creations Product. I wish you all good happy day. Oh my dear friend, what can I say? This is just so beautiful. Variation Week At Sweet Pea Stamps. Sale at SWEET PEA STAMPS!!!!!!!!! !